As part of the special operation “Migrant” the joint inter-agency group composed of operational units of SBGS, the Main Investigation Department of the National Police, Department of National Security and National Police for procedural guidance of the Prosecutor General of Ukraine exposed and documented the organizers of the illegal migration channel. In particular, the immigrants from Asia and Africa were illegally issued passports of the citizens of Ukraine for travelling abroad, and for this purpose they used forged passports of citizens of Ukraine and seals on registration of the captured persons on the territory of Crimea. The scheme functioned at the assistance of the officials of the Migration Service in Odessa region. During a pretrial investigation the law enforcers established more than 60 facts of the illegal issuance of fake passports by the professional staff of the Migration Service to the foreigners and stateless persons. Some of them even did not cross the state border of Ukraine. On August 30, the Inter-Agency group conducted more than 30 searches at the place of residence of the defendants in the case and in the structural subdivisions of the Migration Service in Odessa region. The large sums of cash in foreign currency were confiscated as well as documents, seals and other tools of crime. 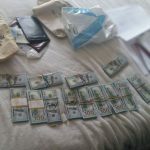 According to the results of the conducted actions, the persons involved in the case were declared a suspicion of illegal transfer of foreign citizens across the state border of Ukraine. At present, the further investigation (searching) actions are aimed at collecting evidences of the committed criminal offences and detection of other facts of illegal issuance of documents to foreigners. This entry was posted in Translated Media-News from Ukraine on August 31, 2018 by oksana.